Gorgeous Oliver has been adopted! 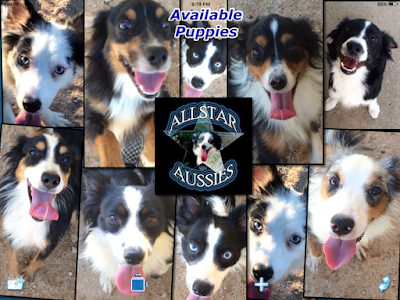 Here are some of our gorgeous All-Star Aussies and Past Puppies in their new homes! See new pupdate below! Click here to go to our new Available Puppies! page! We have pups and young adults available! We have black tris and blue merles, boys and girls, some with blue eyes, including blue eyed tris! We are currently running specials on most brown eyed black tri boys. They are $1000 off for a limited time! We also have two blue merle boys that are also on special $1000 off! We have tiny toys, toys, and minis! If you have been wanting an All-Star pup, now is a good time! Just contact us and let us know what you are looking for and we will match you up with the right pup and personally deliver him or her to you on their adoption day! Armani and Gucci are available! 10/24/2015 We had 6 beautiful puppies! 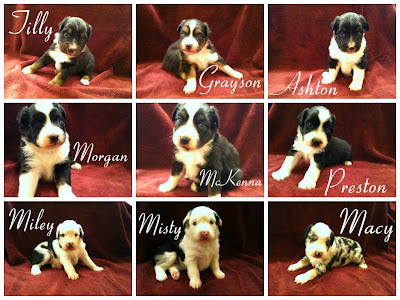 There are 4 black tri boys, 1 black tri girl, and 1 blue merle girl! Pics coming soon and photos are being posted on our Facebook page often, so like our page for pupdates and cute puppy pics! 10/21/2015 Pupdate news! 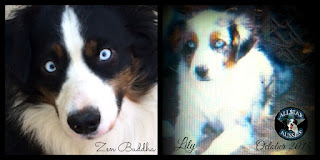 We are expecting beautiful new puppies from our gorgeous blue eyed tri mini stud from ghosteyes lines, Champion Zen Buddha, and our beautiful new blue eyed blue merle Rimfire toy girl, Lily!! She is due this week and It looks like she may have them as early as tonight or tomorrow so check back soon!! Click here to go to the new October 2015 Puppies page! 9/9/2015 Pupdate: We have new 2015 puppies available to go home with you now!! Like our Facebook page to get new puppy updates! The New 2015 Puppies big puppy debut page is now up!! Go look at how adorable these little puppies are! Click here to see the new 2015 Puppy Page! ^^---Like us on Facebook to get puppy updates! That is mostly where we post updates now! We had 9 new puppies born on November 3rd/4th, 2014! We currently have 5 puppies available! There are 6 girls and 3 boys. 3 Blue Merle Girls, 3 Black Tri Girls. 2 Black Tri Boys, and 1 Blue Tri Boy. Click here to go to the November 2014 Puppies Page!! We also have some older trained young adults available to go home now! Alex is one of them! 7 adorable NEW puppies were born on September 9th, 2013!! Our Feb 2013 litter of 7 puppies arrived on February 5th, 2013! All of our Feb 2013 puppies have been adopted. Watch our video compilation of our 2011 All-Star puppies showing off their tricks! 7 All-Star Puppies Show Off Their Tricks! 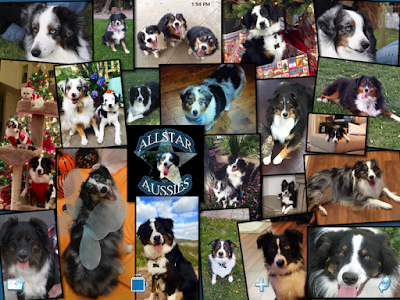 All-Star Mini Aussies is a small high quality breeder of truly one-of-a-kind trained and champion sired Miniature Australian Shepherd puppies. We are located in Southern California. What's the best thing about All-Star Mini Aussies? By the time your puppy comes home at 8 weeks old, your puppy will already be clicker trained to come, sit, shake, and lay down! Mini Aussies make great companions for active families, and great competitors for dog performance sports such as frisbee, agility, obedience, herding, and flyball. More updates to come, keep checking in with us! Thanks!